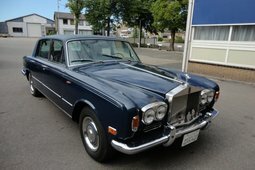 Rolls-Royce Silver Shadow in great mechanical and cosmetic condition and with only 73,659 miles on the odometer. The car drives great and start, drives and stop with no issues. The chrome and interior of the car are in excellent condition. The car has the 6.75-liter V8 producing 189 brake horsepower from the factory and a 4-speed Turbo Hydramatic 400 automatic transmission. A distinctive feature was a high-pressure hydropneumatic suspension system. The car has a Danish title and registration and is coming out of long-term Danish ownership. 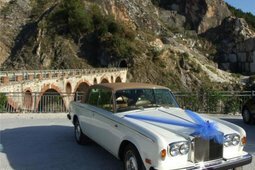 The Rolls-Royce is the epitome of British luxury and this 1975 Rolls-Royce Silver Shadow is a fantastic car that can be driven and enjoyed as is for many years to come. 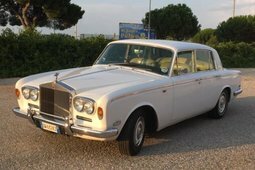 The Rolls-Royce Silver Shadow is a luxury car that was produced in the United Kingdom in various forms from 1965 to 1980. It was the first Rolls-Royce to use unitary body and chassis construction, in response to concerns that the company was falling behind in automotive innovation. The design was a major departure from its predecessor, the Silver Cloud; although several styling cues from the Silver Cloud were modified and preserved, as the automobile had sold well. The John Polwhele Blatchley design was the firm's first single bow model. More than 50% of its predecessor had been sold on the domestic market where, by the standards of much of Europe and most of North America, roads were narrow and crowded. The original Shadow was 3 1⁄2 inches (8.9 cm) narrower and 7 inches (18 cm) shorter than the car it replaced but nevertheless managed to offer increased passenger and luggage space thanks to more efficient packaging made possible by unitary construction. Aside from a more modern appearance and construction, the Silver Shadow introduced many new features such as disc rather than drum brakes, and independent rear suspension, rather than the outdated live axle design of previous cars.